Awareness of the ins and outs of the latest instruments governing tax regulations is a must for the international tax practitioner. Aficionados know by now that the U.S. Treasury Department's draft Model Income Tax Convention, published in 1981 (the 1981 Model), was withdrawn as the official U.S. Model in 1992. At long last, on September 20, 1996, the Treasury released the 1996 U.S. Model. For the first time a technical explanation accompanies the Model. Practitioners need a quick and complete apprisal of new developments and changes since the 1981 Model. 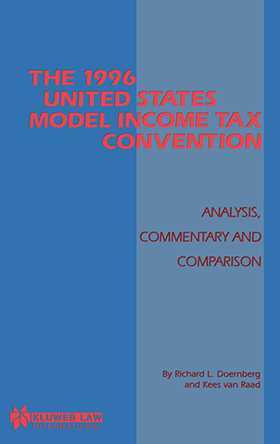 This monograph contains an article-by-article, paragraph-by-paragraph analysis of the 1996 U.S. Model Tax Convention. The commentary relates each Convention paragraph to any corresponding provisions in the 1981 U.S. Tax Convention and the 1995 OECD Model Convention. In addition, the commentary discusses and analyses the technical explanation accompanying the new 1996 U.S. Model. The 1996 U.S. Model not only offers insight into the Treasury's negotiating position with respect to future tax treaties, it also provides a window onto the Treasury's interpretation of existing treaties that employ language similar to that in the new U.S. Model. As a result, this work will inform practitioners on a number of valuable levels.